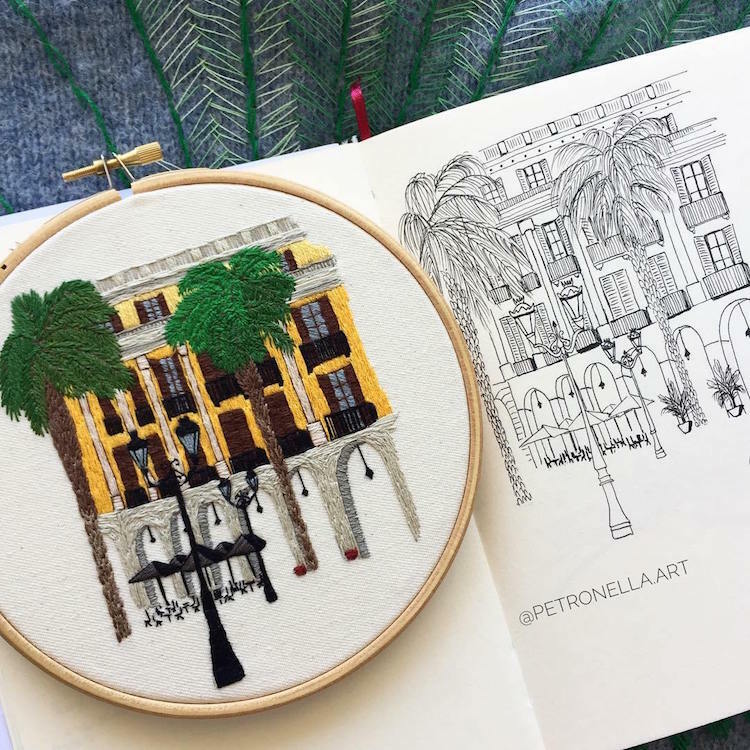 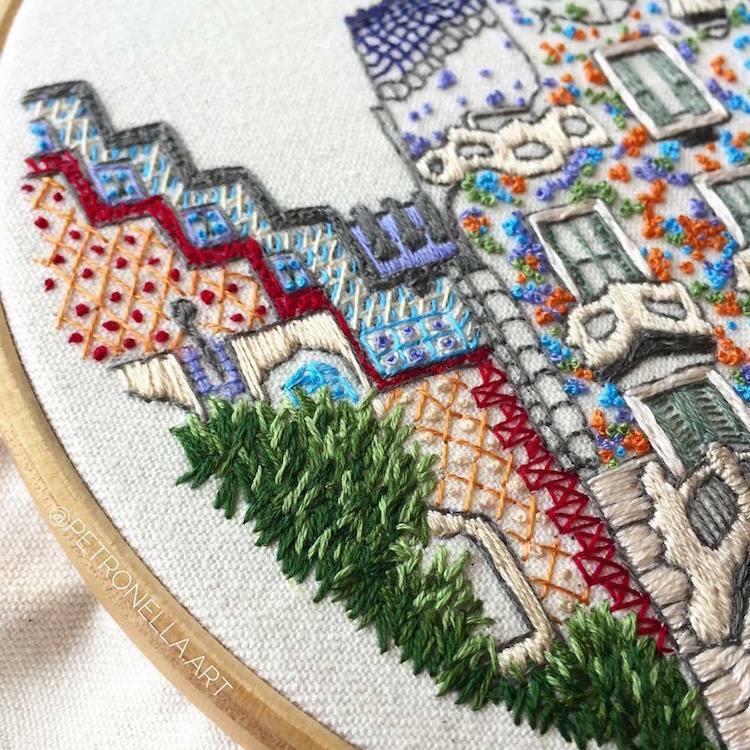 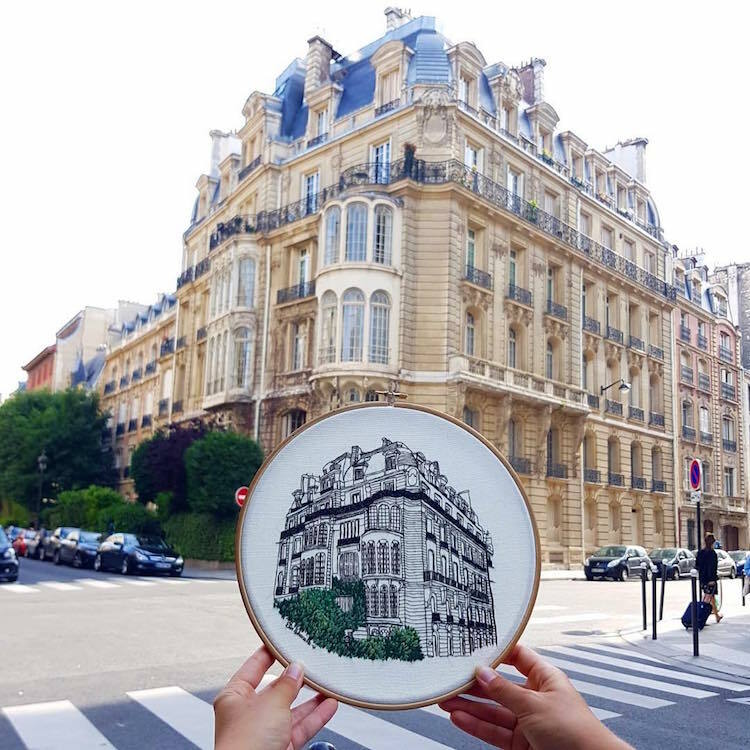 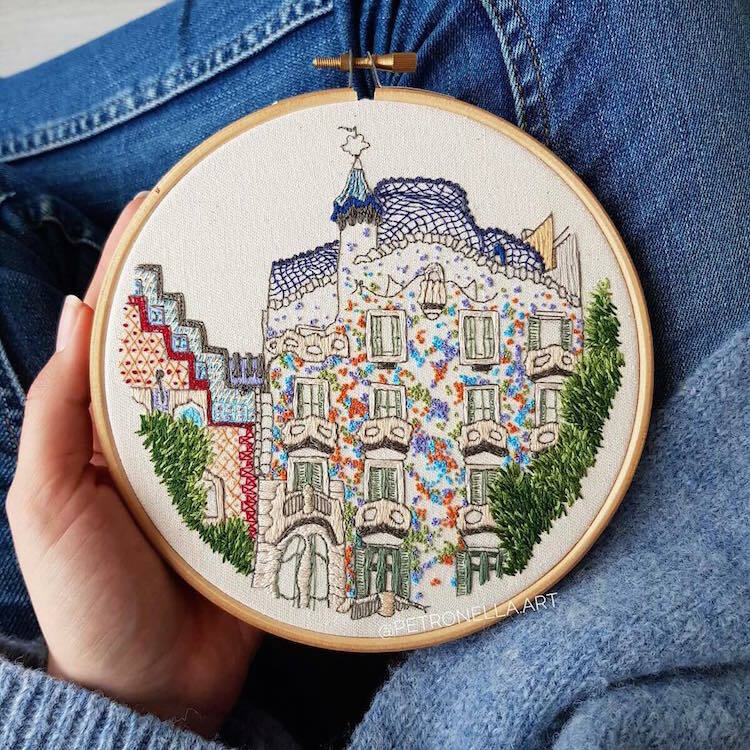 Creative couple Charles Henry and Elin Petronella travel the world together, creating stunning embroidery designs inspired by the architecture they come across. 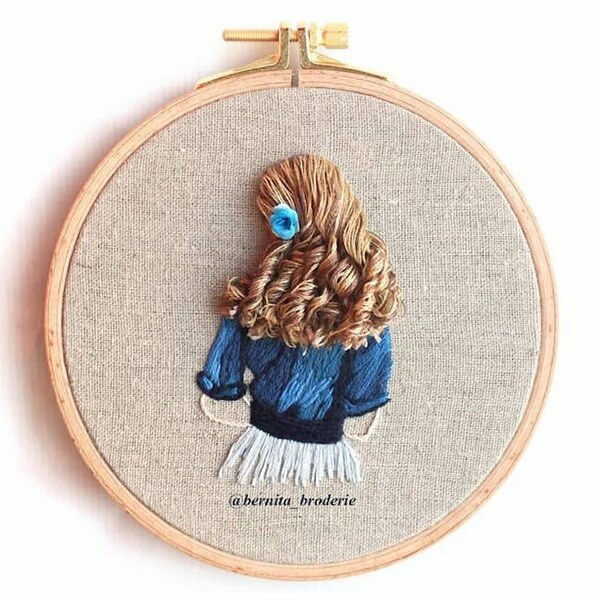 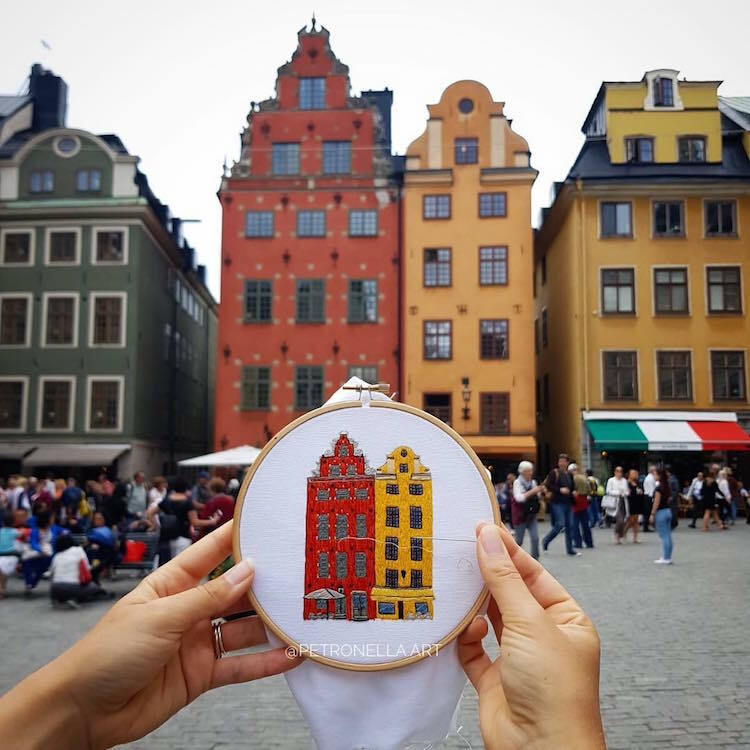 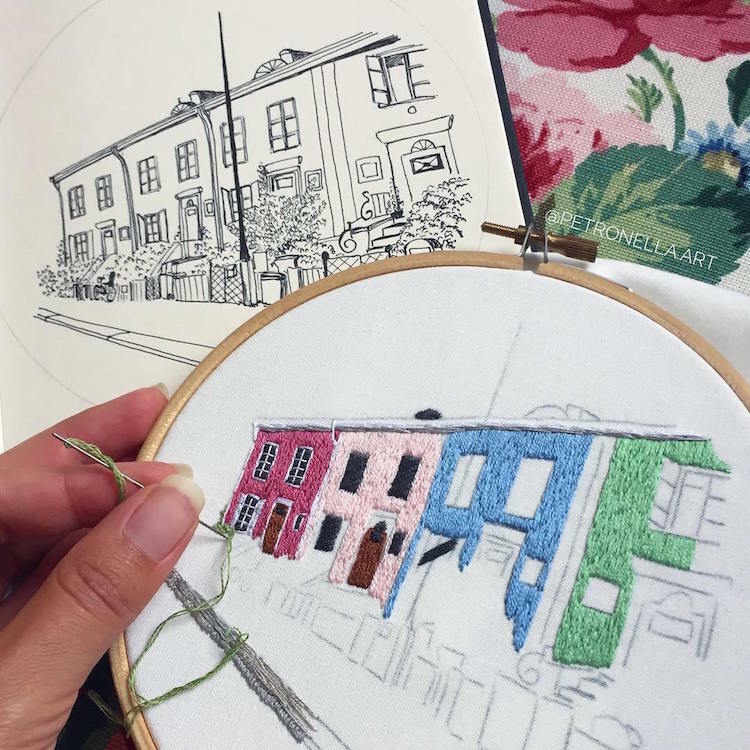 So far, the French-Swedish textile artists have been all over Europe, capturing each vibrant city scene stitch-by-stitch in a series of embroidery patterns. 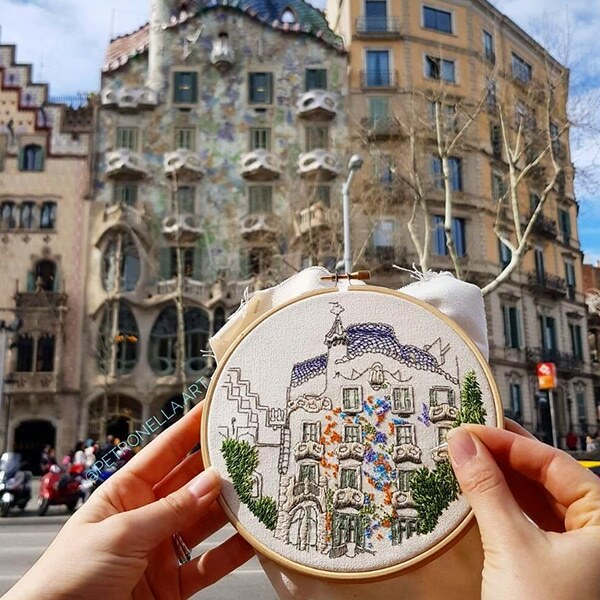 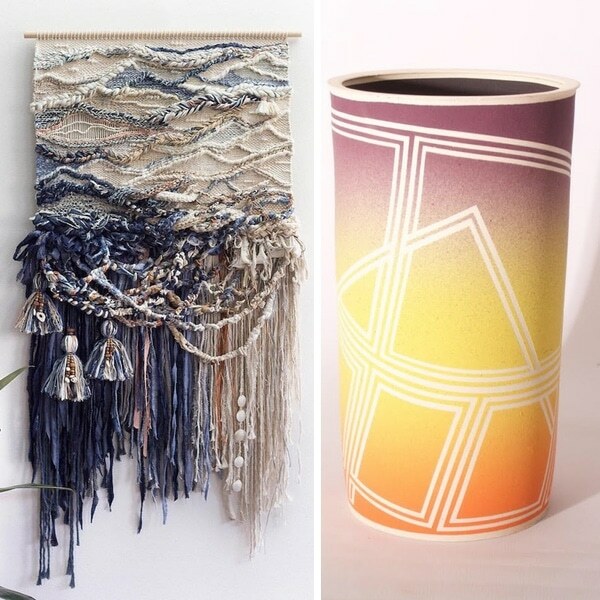 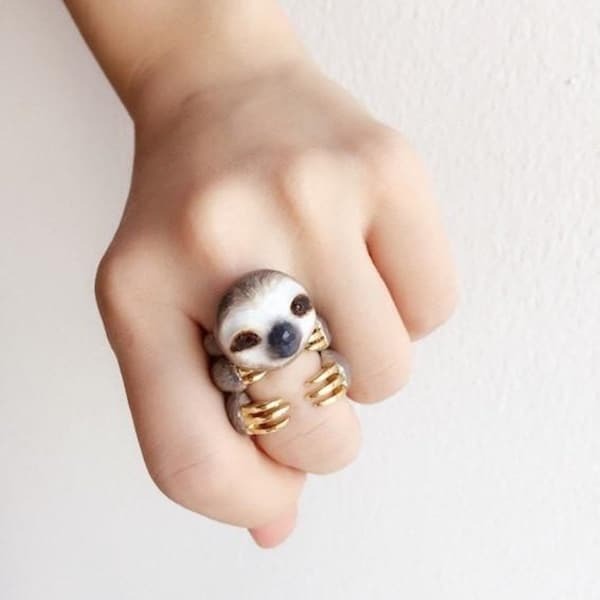 From the colorful streets of Copenhagen to the modernist architecture of Barcelona, each design is sure to evoke strong feelings of wanderlust. 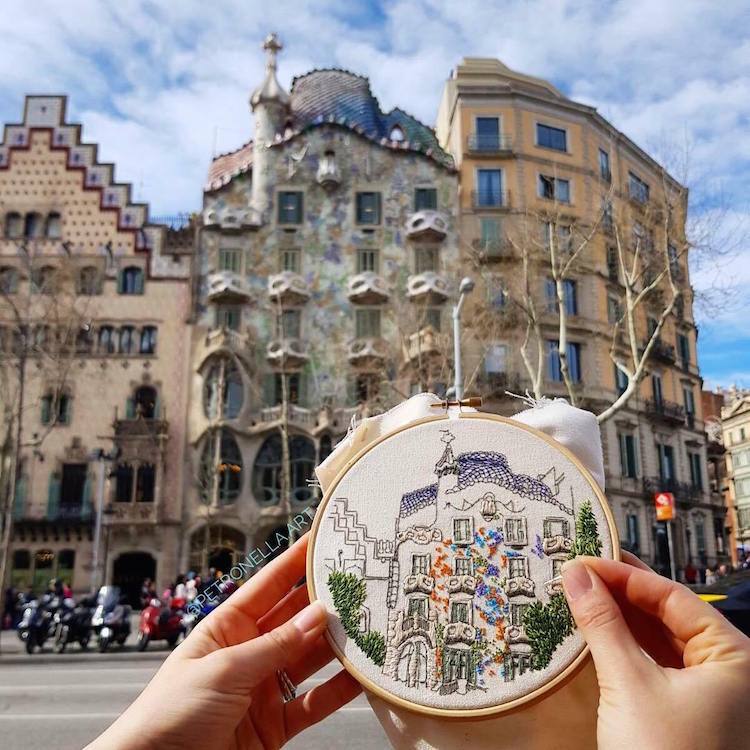 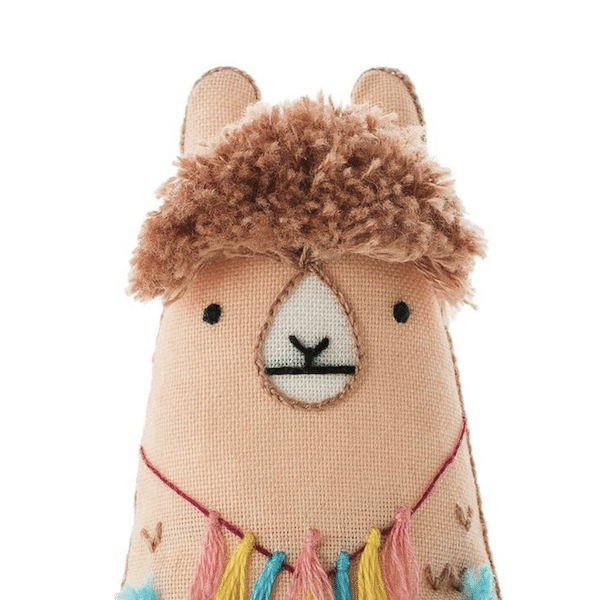 Charles’s and Elin’s ever-growing collection features textile versions of popular landmarks—such as Antoni Gaudí’s Casa Batllo in Barcelona—and every colorful mosaic is rendered in a variety of embroidery stitches. 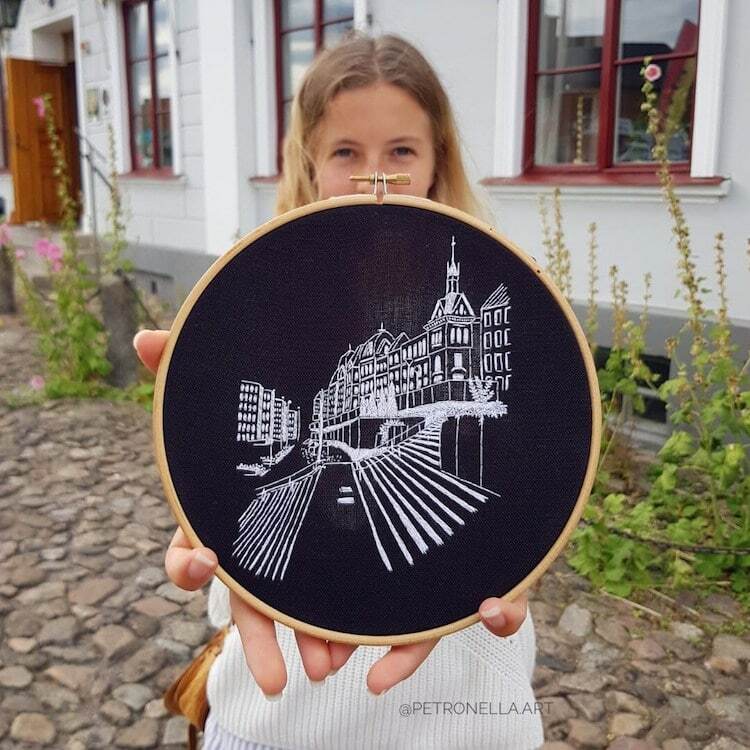 Other designs feature outlines of streets in black thread, while the central subject stands out in color. 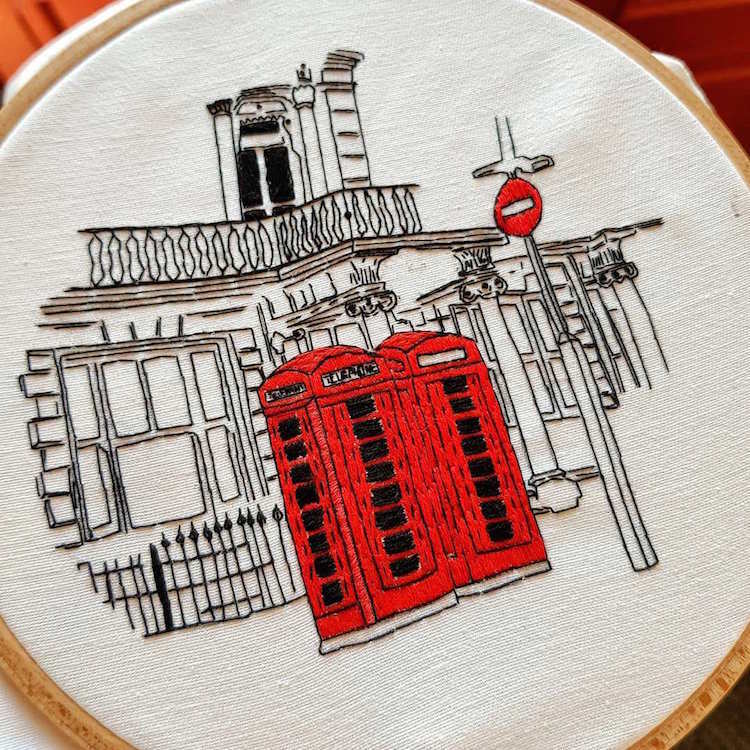 In one image, we see a London telephone box is stitched in its iconic red hue; while in another, a Lisbon tram is represented in yellow. 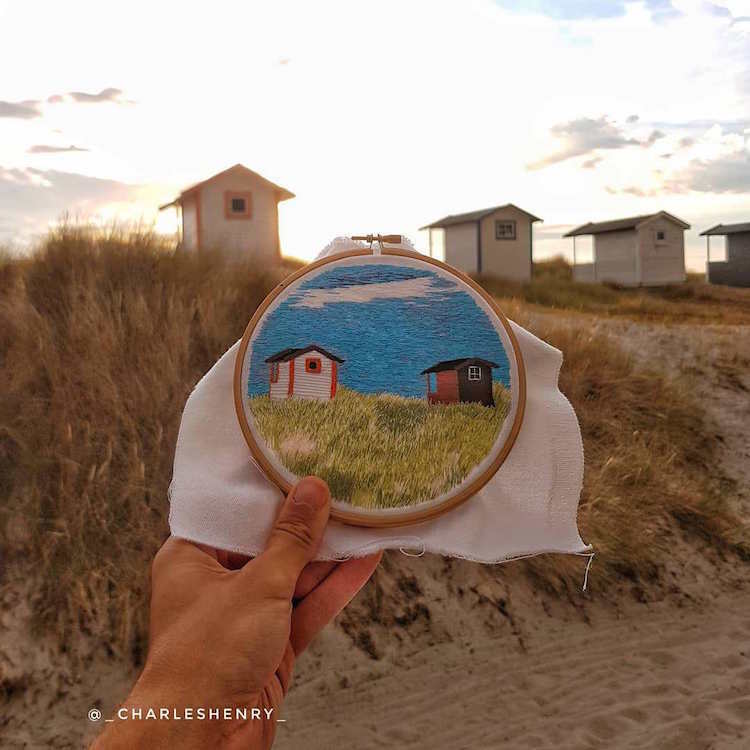 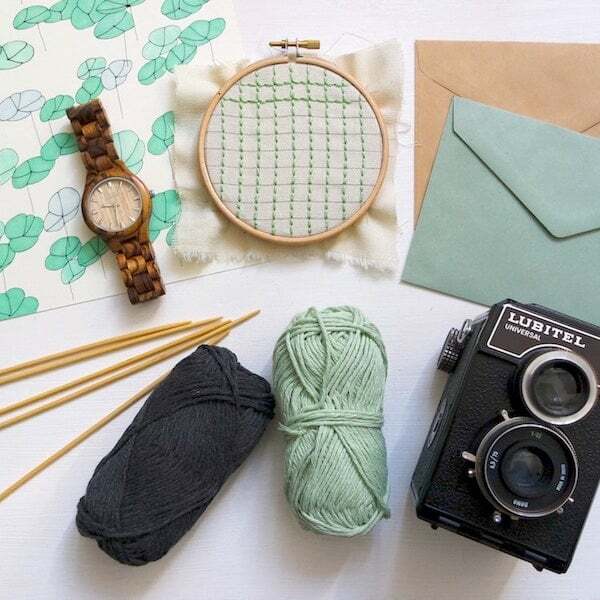 If you feel inspired to start stitching at home, you can download PDF embroidery patterns from Charles’s and Elin’s collection via their website. 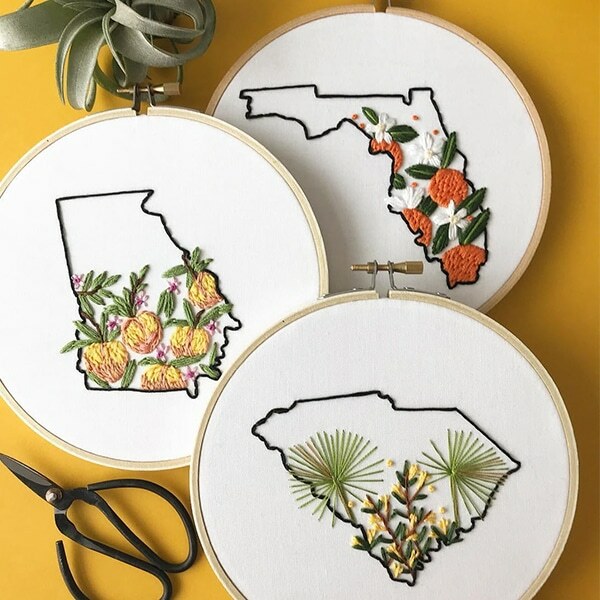 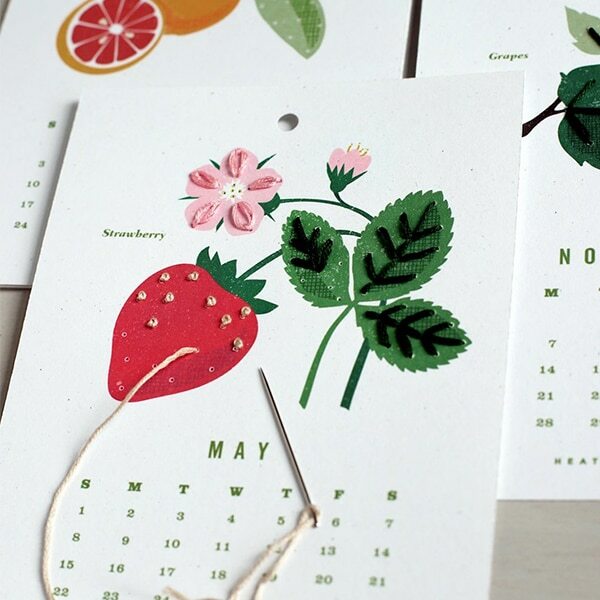 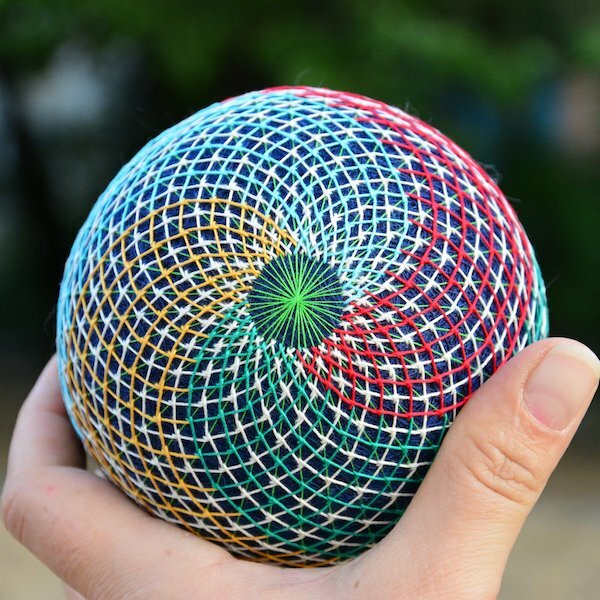 Each design comes complete with a technique and color guide, as well as helpful supply recommendations. 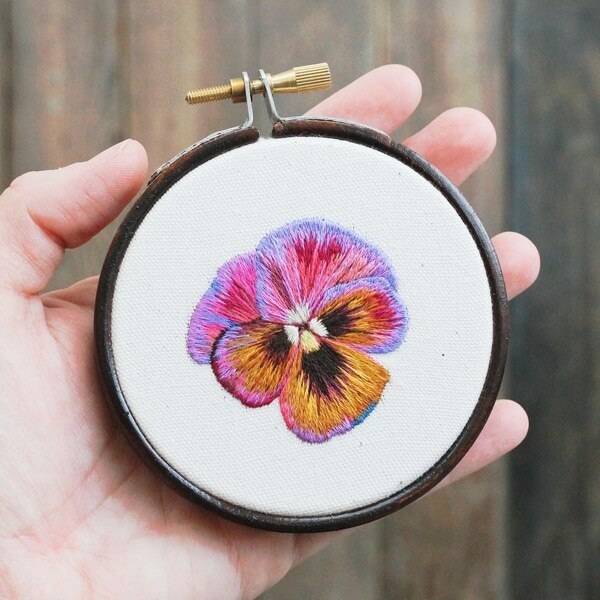 The couple also offers online courses, where you can learn to master the art of hand embroidery. 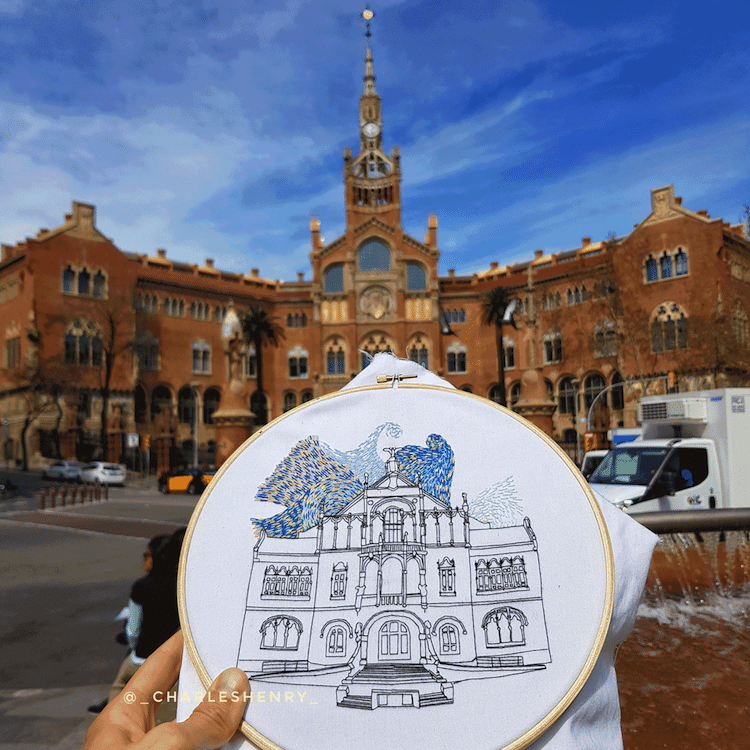 Travelers and artists Charles Henry and Elin Petronella create embroidery patterns inspired by European architecture. 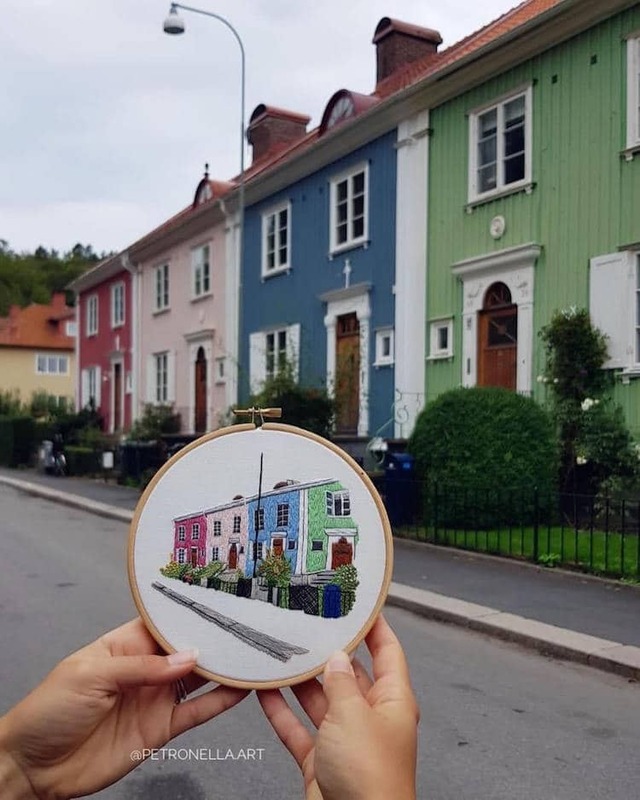 So far, the French-Swedish couple have been all over Europe, capturing each vibrant city scene stitch-by-stitch. 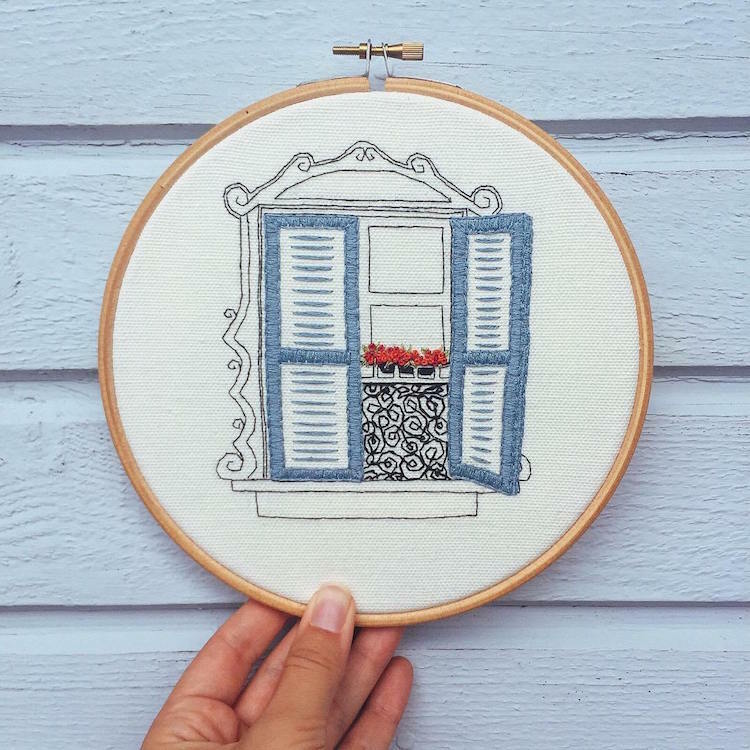 Each design has generously been made into downloadable PDF embroidery patterns, so you can recreate them at home. 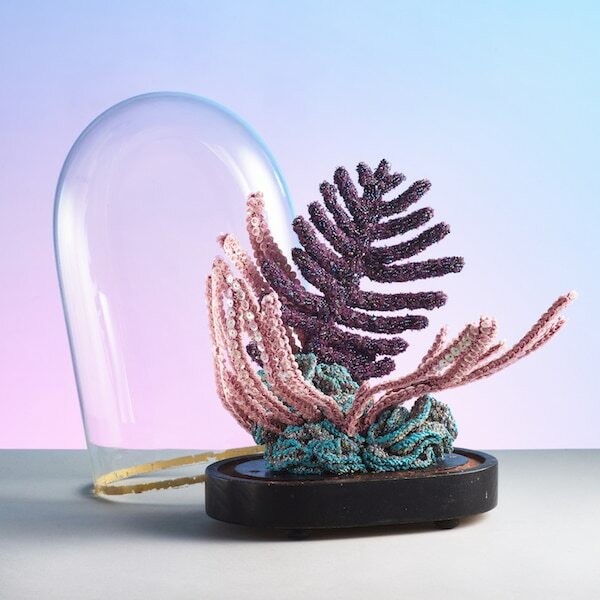 My Modern Met granted permission to use photos by Charles and Elin. 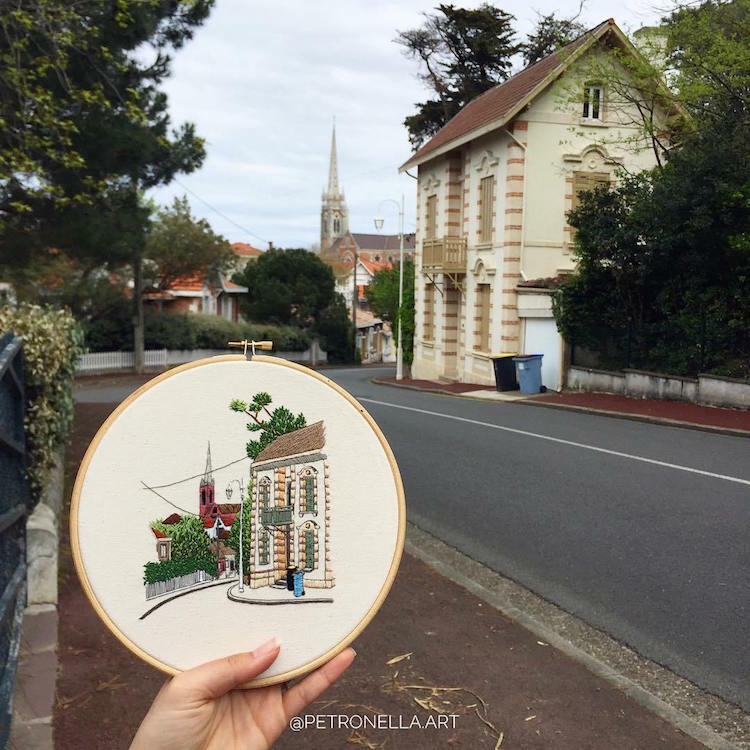 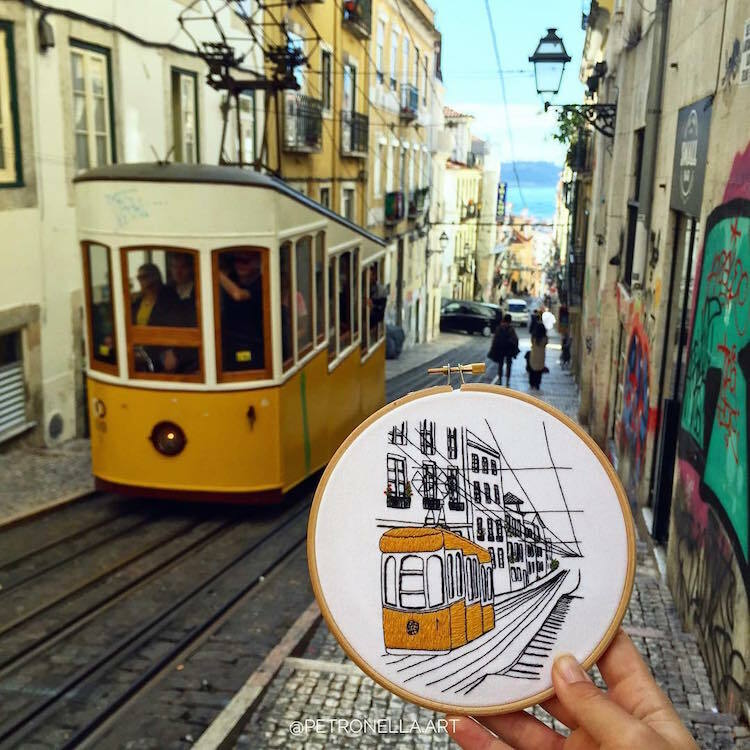 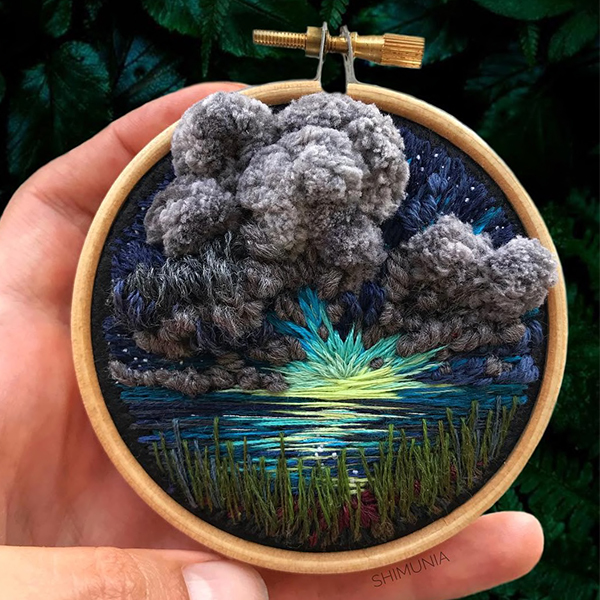 Like these embroidered travel snapshots?